Ceramics is nature and culture, art and magic, humanity and divinity … The Pottery is a universal language with a syntax , a lexicon and the same magical elementsyou primordial life , air, water , earth and fire . The Pottery is simple beauty , goodness ancient ancestral musicality , sensitivity immortal … For half a century, the family Battocchio practice one of the oldest languages ​​in the world , the art of ceramics , and cultivates the earth magic that turns with the memory and the ability of skilled hands. Every item labled "B.C. 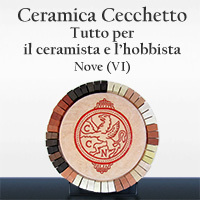 ", Ceramiche Bruno Costenaro, is meticulously produced inside our company following all the steps necessary to obtain a perfect product, moulded and finished with a high level of quality. Every item is modeled following the instructions personally dictated by Bruno Costenaro according to his taste, and reflecting that of his customers and market trends. Once the first model is made, moulds are made to produce the final products. Principe Porcelain wins the prize of the context "YouImpresa 2015"
Rewarded at La Scala Theatre the six winners of the sixth edition of the prize dedicated to videos of Italian companies and exhibitors at Fiera Milano. This video describes the workmanship of porcelain.